Congratulations to Janet Yellen for becoming the first woman to chair the Federal Reserve! 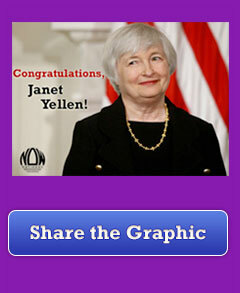 Join us in congratulating Janet Yellen by sharing our Facebook graphic. Women, working families, the elderly and everyone struggling in today's economy need an ally at the Fed. Janet Yellen, who recognizes that reducing unemployment is as important as keeping inflation under control, is that ally. Will you join us and share the Facebook graphic? You're probably wondering why sharing a graphic in Facebook matters. Let me tell you. We need to show that supporting women's equality is a winning strategy. We need to show the politicians that we are paying attention. That we are a force to be reckoned with. We need to do this in a public way and what's more public than a viral image on the internet? Will you help us make Janet Yellen's confirmation go viral? This is a historic moment for gender equity. However -- and I want to be clear about this -- Janet Yellen is the right choice, male or female. She is the right choice because of her understanding of labor markets, job creation, and ability to hear all points of view and then make a decision. Now that change is taking place at the very top, it's time to break glass ceilings at every tier of the financial-industry citadel. Thanks for all you do for women's equality.